Kuala Lumpur (Agenzia Fides) - The Government of Malaysia must commit itself to formulating laws and implementing policies to eradicate corruption and poverty from society: this is what is asked, in an appeal sent to Fides, in preparation for the "Malaysia Day" of September 16, which commemorates the birth of the nation, the Christian Federation of Malaysia (CFM) that, in harmony with Christian values, works to make the country "a nation of harmony, peace, equal opportunity, equality and prosperity for all". "Malaysian citizens strive to build a united nation as imagined by the founding fathers. There is a palpable expectation that Malaysia is truly a nation where people can live together and prosper", says the Federation in a note sent to Fides, reaffirming its message of coexistence, harmony, peace, equality. The CFM is an ecumenical body that in Malaysia includes the Council of Churches of Malaysia, the Christian Evangelical Fellowship and the Catholic Episcopal Conference of Malaysia. Currently the president of the Federation is Catholic Archbishop Julian Leow, at the head of the Catholic diocese of Kuala Lumpur. In the message sent to Fides, the Federation solicits prayers "for government officials and leaders of state governments", inviting the faithful to pray "so that the opposition carries out a credible role of control and balancing of government action". The message reaffirms the request to "put aside our differences and work together so that there can be peace, harmony and prosperity for all". 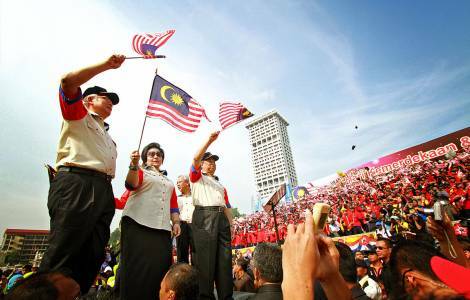 The message of the Federation takes on a special meaning this year, following the historic result of the general elections which saw, a change of government: for the first time, after independence in 1957 and the formation of Malaysia in 1963. In preparation for Malaysia Day, which is celebrated on September 16th to commemorate the birth of the Malaysian Federation (formed by part of the Malacca Peninsula and the Sabah and Sarawak provinces, in the north of the island of Borneo), Archbishop Julian Leow President of the CFM, says: "We are approaching the commemoration with deep gratitude for the peaceful elections and the transition towards a new government, we thank God for his mercy, praying to bless our nation with new hope". "We pray that the members of the opposition will help to build a two-party system, in the spirit of the principle of shared responsibility, putting into practice the manifesto for the good and welfare of all Malaysians", he adds. Exhorting to "defeat corruption that will lead to the ruin of any nation", Mgr. Leow hopes that "the government will act in a fair and just manner, not for political revenge against the supporters of the previous government". "Malaysia needs to build a mature democracy where there is no fear of reprisals every time there is a change of government", says the Archbishop. The Malaysian population has welcomed the removal of the tax on goods and services, canceled in order to alleviate the difficulties of average and low income groups. However, "much more needs to be done to rebuild our economy", notes the Bishop, noting that "the revision and cancellation of extravagant mega-projects is a great start, but a thorough review of policies for development is also urgently needed regarding the poor and needy Malaysians of all ethnic groups and religions, in order to build a just and fair society". The Archbishop recalls the condition of ectreme poverty of indigenous native peoples such as the Penan and the Orang Asli, and also of the poor who live in cities, inviting to "curb the shameful disparity between the rich and poor".